For other people named Al Simmons, see Al Simmons (disambiguation). Aloysius Harry Simmons (May 22, 1902 – May 26, 1956), born Alois Szymanski, was an American baseball player. Nicknamed "Bucketfoot Al" because his stride took him toward third base, he played for two decades in Major League Baseball (MLB) as an outfielder and had his best years with Connie Mack's Philadelphia Athletics during the late 1920s and early 1930s. In between, Simmons played with the Chicago White Sox, Detroit Tigers, Washington Senators, Boston Braves, Cincinnati Reds and Boston Red Sox. Simmons was born in Milwaukee and grew up as a fan of the Philadelphia Athletics. In the fourth grade, he received a spanking from his father for insisting that he wanted to play professional baseball. When he persisted in asserting his desire to be a baseball player, his father replied that he had better become a good player. Simmons was known by his birth last name (Szymanski) until he was playing for a local minor league team and he was tired of hearing people mispronounce it. He saw an advertisement for a company named Simmons Hardware and decided to take on the last name of Simmons. In his second season with Philadelphia (1925), Simmons led the AL with 253 hits with a .387 batting average, 24 home runs and 129 runs batted in (RBI). He scored 122 runs, hit 43 doubles, and finished with a .599 slugging percentage. His 85 multi-hit games constitute a single-season MLB record. He earned the second-most votes for the league's Most Valuable Player Award. In the following three seasons, he hit .341, .392 and .351 and drove in 110, 108 and 107 runs in those respective years, while finishing fifth in 1926 MVP voting and fourth in 1927. In a final season with Philadelphia, Simmons led the AL with 216 hits. He batted .322, with 35 home runs, 151 RBIs and 144 runs scored in 1932. Simmons finished his Philadelphia Athletics tenure with a .356 batting average, 209 home runs, 1,179 RBI and 969 runs scored in 1,290 games. He drove in 100+ runs in all nine seasons and scored 100 or more runs in five seasons. In three World Series appearances for the A's, Simmons hit .333 with 6 home runs, 17 RBI and 15 runs scored in 18 games. In late September 1932 the Athletics sold Simmons, Mule Haas and Jimmy Dykes to the Chicago White Sox for cash. The amount of the purchase was not disclosed at the time the sale was reported, though it was said to be the largest cash purchase ever made by the White Sox and possibly the largest purchase in AL history. Newspaper reports speculated that Athletics owner Connie Mack might be breaking apart the Athletics team that had been so successful between 1929 and 1931. A "bucketfoot" hitter (his nickname was "Bucketfoot Al") who strode toward third base when hitting, Simmons hit 307 career home runs. He compiled more hits than any right-handed batter in AL history until surpassed by Al Kaline. 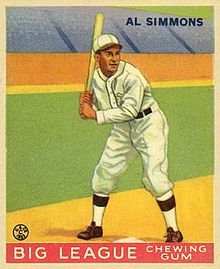 A deadly clutch hitter and a favorite of manager Connie Mack, Simmons won batting titles in 1930 and 1931 to help the A's to consecutive pennants. He recorded a .300 batting average and 100 or more RBI in his first eleven major league seasons. Simmons accumulated 1,500 hits in 1,040 games and 2,000 hits in 1,393 games, which remains the shortest number of games needed to attain both marks in major league history. He played from 1924 through 1941, did not play in 1942, then played again in 1943–44. He earned a lifetime batting average of .334. He hit .340 or better in eight different seasons, with four seasons of better than .380. He also compiled 200 hits or better in a season six times, with five of those being consecutive (1929–33), and 199 and 192 hits in 1926 and 1934 while only playing 147 and 138 games in those years. He also hit for power, finishing in the top six in AL in home runs for seven consecutive seasons (1925–32). Simmons recorded 8 five-hit games and 52 four-hit games in the majors. He also hit .329 with 6 home runs, 17 RBI, 15 runs scored and .658 slugging percentage in 19 World Series games. Simmons was also a fine outfielder in his era, recording a career .982 fielding percentage. ^ Al Simmons at baseball-reference.com, accessed January 19, 2011. ^ Al Simmons. Article by Fred Stein. SABR Biography Project. Retrieved on March 7, 2018. ^ "Szymanski, Aloysius Harry (Al Simmons)". Pennsylvania Center for the Book. Archived from the original on 2013-05-15. Retrieved December 28, 2014. ^ "Batting Game Finder, From 1913 to 2017, (requiring H>=2)". Baseball Reference. Retrieved August 1, 2017. 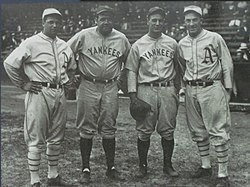 ^ "Athletics sell three big stars to Chicago Sox". The Tuscaloosa News. September 30, 1932. Retrieved January 21, 2015. ^ "Al Simmons sold to the Boston Bees". The Milwaukee Journal. December 29, 1938. Retrieved January 21, 2015. ^ "Illness forces Simmons to quit as Indian coach". Toledo Blade. April 4, 1951. Retrieved January 21, 2015. ^ "Al Simmons left enviable record". The Miami News. May 27, 1956. Retrieved January 21, 2015. This page was last edited on 1 February 2019, at 12:56 (UTC).